Among the many models of school reform that have emerged in the late 20th and early 21st centuries, one has endured for more than 50 years: the School Development Program (SDP). Established in 1968 by renowned child psychiatrist James P. Comer and the Yale Child Study Center, the SDP is grounded in the belief that successful schooling—particularly for children from disadvantaged backgrounds—must focus on the whole child. With that in mind, the SDP encompasses both academics and social-emotional development, and it is founded on positive and productive relationships among students, teachers, school leaders, and parents. 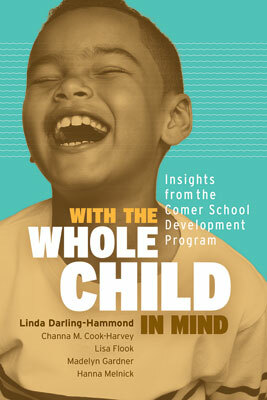 With the Whole Child in Mind describes the SDP's six developmental pathways (cognitive, social, psychological, physical, linguistic, and ethical) and explains how the program's nine key components (in the form of mechanisms, operations, and guiding principles) create a comprehensive approach to educating children for successful outcomes. Firsthand recollections by Comer, school leaders and teachers, and SDP staff members provide an inside look at the challenges and successes that eventually transformed severely underperforming schools into models of excellence. Linda Darling-Hammond, one of the country's foremost experts on K–12 education, and her colleagues argue persuasively for the continuing relevance of the SDP. Far too many schools still operate in a high-pressure environment that emphasizes testing and standardized curricula while ignoring the fundamental importance of personal connections that make a profound difference for students. Fifty years on, the SDP is still just as powerful as ever. Linda Darling-Hammond is the Charles E. Ducommun Professor of Education Emeritus at Stanford University, where she founded the Stanford Center for Opportunity Policy in Education and served as the faculty sponsor of the Stanford Teacher Education Program, which she helped to redesign. Channa M. Cook-Harvey is the director of social and emotional learning at Folsom Cordova Unified School District. In collaboration with Instructional Services and Special Education, she is working to strengthen FCUSD's efforts to educate the whole child. Lisa Flook is a senior researcher at the Learning Policy Institute, involved in translating research on children's learning and development to inform practice and policy. She has conducted research in educational settings for over 15 years. Madelyn Gardner is a research and policy associate at the Learning Policy Institute. There, she has conducted research on issues of access and quality in state early learning systems and on effective preparation and development of teachers and school leaders. Hanna Melnick is a research analyst and policy advisor at the Learning Policy Institute, where she coleads the Early Childhood Learning team. Her research there has focused on school climate, social and emotional learning, accountability, and building effective early learning systems.